i Click 'view all' to instantly compare this ok deal with offers on other top planners & calendars. UNDATED Daily Planner & Agenda & To-Do List Hardcover - 272 Pages is currently selling at $22.87, approximately $1.53 higher than average. With a lowest price of $19.87 and an average of $21.34 it is selling on the high end of its usual range. Price volatility is 0.74% (meaning it does not change often), so you might have to wait a while for the price to drop. Right now this product is a recommended 'ok deal'. There is a coupon available for an additional 10% off. Compare the current price, savings (in dollars & percent) and Buy Ratings for the top Planners & Calendars that are closely related to UNDATED Daily Planner & Agenda & To-Do List Hardcover - 272 Pages. Here is how UNDATED Daily Planner & Agenda & To-Do List Hardcover - 272 Pages compares with other leading Planners & Calendars. Schedule Your Work, Business, Social Life & Daily Routines and Keep Your Time Management In Check with the Best Agenda by Cossac Planner! Are you looking ahead to a busy year and just got to keep things organized to perfection? Do you need a convenient, all-in-one daily planner to help you focus on setting your personal goals, review your progress and keep motivation high every day? Are you tired of poor quality organizers with thin paper that bleeds and bulky covers that take up too much space in your bag? Designed with goal oriented users in mind, this premium daily organizer will let you keep track of a lot more than just your day to day tasks. 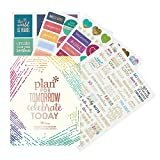 This planner includes daily, weekly and monthly pages, mindmap sections, daily priority, sport and habit boxes and even special review sections to help you keep things in perspective! Backed by a 100% money back guarantee, you have nothing to lose! If you don't absolutely love your 2018 daily planner, we'll send your money back in full! Order Yours Today and Get Your Life on the Right Track! Click "Add to Cart" Now, While Supplies Last! 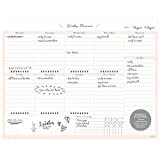 Features?6 MONTH UNDATED PLANNER (272 pages): Boasting a super convenient and highly functional layout, this 2018 daily planner will let you organize your days, weeks and months with ease. Inside you will find 4 layout types, with checkboxes, notes sections, mindmap and special boxes for highlighting daily priorities, habit and exercise tracking.? 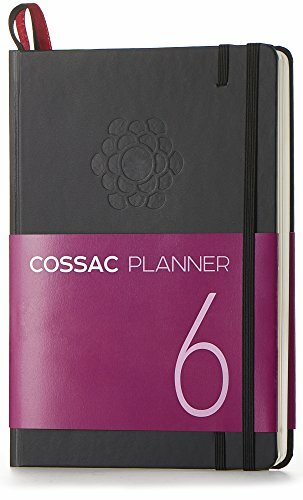 ACHIEVE YOUR GOALS & BOOST PRODUCTIVITY: Cossac planner 2018 2019 is just what you need to keep your life totally organized. Plan ahead your day, schedule work, keep your priorities in sight to achieve a life of happiness and productivity, without wasting a minute!? PREMIUM THICK PAPER: With a durable soft touch hard cover, 100gsm swedish eco friendy acid-free paper, this agenda planner is a must-have for anyone who likes putting ideas into action! Suitable for both men and women, it makes a sophisticated gift idea for any occasion.? BEAT PROCRASTINATION: Changing your life is easy when you have this daily goal journal to keep you motivated to stick to your plans. Use this agenda 2018-2019 daily planner to schedule your day and week, review your progress, improve important skills, organize your study and reach your highest potential.